I used to write posts about daily life as an expat in Roatan and those continue to be some of my most popular here on the blog. Since, apparently, you guys like to peek inside at the mundane bits of expat life, let’s get this series started again! This time, I’ll let you know all about daily life as an expat in Malta. 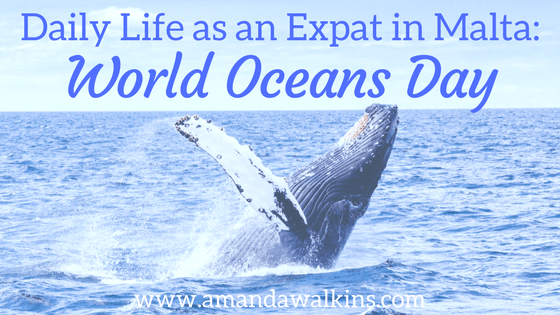 In this post, we’re talking about what we did on World Oceans Day. As with all working people, a typical day for me entails working. Sorry to bore you already, but life is life everywhere! That’s a crucial component of expat life you need to remember. Unless you’re retiring, independently wealthy, or able to live on a single income in your home, working will pay your bills. Yes, bills still have to be paid in other countries! Disappointing, I know. With my Irish-Colombian getting back into the scuba diving industry, our days start early again. By 6:30, he’s up and ready for work, cooking breakfast. We are serious about breakfast, guys. None of this grab-a-granola-bar-on-your-way-out-the-door stuff. No. We go all out and, yes, it’s worth waking up earlier to do so. Breakfast burritos happen to be my fave, just in case you’re wondering and willing to make me breakfast someday! My Irish-Colombian heads out the door by 7:30 to frolic in the sea all day. His 10-minute commute walking to work isn’t too shabby at all! Heading out for a shore dive with our visiting friends! My commute wins, though, if we’re honest. Still in pjs (go ahead, you can judge), my laptop is open as soon as I wave goodbye to him from the balcony. And, yes, I wave from the balcony. Because what use is a street-front balcony if not to dramatically send off your husband each morning?! It’s also useful for all of my neighbors who call their kids in for dinner from the balcony – that still makes me smile every day. Laptop humming, I get to work. As a freelance writer, my top priorities are always client deadlines. I create my own calendar based on my clients’ needs, so it’s important to adhere to those dates and to plan my schedule in advance to avoid rushing at the last minute. It also lets me plan and complete my work in advance when friends are coming to visit (hint hint…just saying, friends!). I’ve also been blogging a lot more here just for myself, which I’m sure you’ve noticed. I won’t lie – the frequency of my blogging for fun is relative to my overall enthusiasm for our home. I really struggled with the climate back in the UK and Ireland, so my depleted energy was fairly visible here as a result. So between client work and this little ole blog, my workdays now are filled to the brim! I’m usually still at the laptop when the Irish-Colombian walks back in after 5pm (which is inconveniently when I’m often in an ideal writing flow and suddenly the keys are in the door. #writerwoes). Despite my tendency to still be sitting at the laptop when he returns, I make exceptions for certain events. World Oceans Day was one such event worthy of pulling the plug early! World Oceans Day is celebrated annually on June 8th. You are guaranteed to find events or educational opportunities somewhere near you, wherever you are in the world. I don’t care if you’re a scuba diver or scared of the ocean; it doesn’t matter if you’re obsessed with seafood or if you’ve never stood with your toes in the sand watching a sunset spectacle. You MUST care about the health of our oceans. We cannot continue to live the way we’ve been living, discarding everything after a single use and using plastic as the answer to everything. Our consumption and destruction have to end before we irreparably ruin our environment. Watching “A Plastic Ocean,” I learned that the ratio of plastic to plankton in the Mediterranean Sea is 1:2. I learned that if you cut open the stomach of a coastal bird – think magnificent albatross, osprey, seagulls – you will undoubtedly find plastic pieces. Watching a conservationist extract over 200 pieces of plastic from one 90-day old chick nearly made me lose my lunch. I learned that during the course of watching this 102-minute-long film, nearly 3 million pounds (2,877,783 lbs) of plastic entered our oceans. And I also learned that I am very much a part of this problem. Well, it’s better to say that I was reminded how large a role I play in this plastic problem. When we came home, I inventoried our entire apartment. Not ONE purchased item was entirely plastic-free. Look in your fridge, in your cabinets, in your bathrooms and tell me that you don’t have the same situation. Everything we use contains plastic that will never deteriorate in a landfill. Most of our plastics don’t make it to recycling plants. And our recycling systems are basic at best (Germany being an outstanding exception!). I came home from watching “A Plastic Ocean” fired up to do more. So here’s me asking for accountability and solidarity. I want you to truly take stock of your habits at home just like we have done. The first immediate change we could make was in our drinking water. In Malta, the tap water is technically safe, but it’s not really drinkable. The standard response is to purchase a six-pack of 2-liter bottles of water. While we knew it was bad, we just figured that’s the way things are here! We were saving these bottles to reuse them for homemade gym equipment, candle holders, and planters for herbs. After watching the film, we investigated the drinking water situation further. Now, we have a brand new ceramic water base (with a plastic tap, unfortunately) and we use our favorite 5-gallon water jugs like we did in Roatan. Yes, we are still using plastic. But, the 5-gallon jugs are exchanged for full ones when empty and recycled to be reused again. There is also the equivalent of 9 small bottles of water in only 1 large container, so we’re eliminating that superfluous plastic use. I cannot encourage you strongly enough to see what you can change in your own homes. Evaluate your routines and purchases to make a statement against the continuation of plastic everything. While our drinking water solution isn’t at all perfect, we recognize that it’s a positive step and that we can continue to look for other ways to minimize our single-use plastics. You can also support businesses that offer alternative options to plastic. We are now spending more to buy produce from the small local vendors, rather than the large grocery stores. The reason for that is that the large grocery stores require you to bag your produce individually in plastic so it can be weighed and then a price sticker closes the bag off. That means there’s a plastic bag for your peppers, one for your onions, one for your bananas, one for your broccoli, one for your 1 lemon, one for your spring onion, one for your 1 avocado…you get the idea. The amount of plastic used there is disturbing, to say the least. So, instead, we’re opting to give our money to the local vendors that don’t require individual plastic-wrapped fruit and veg. Sure, these are only small steps taken by only one household. And we have many more changes to implement before I can start to feel good about our consumption and our contribution to this problem. But if you don’t care enough to try to change, and I don’t care enough to change, then who will? Making little changes to my daily life as an expat in Malta will make our time here that much more enjoyable. Ensuring that we are doing our best to mitigate our impact on this beautiful island is of utmost importance as a foreigner welcomed into the community. Wherever we’re living in the world, we are cognizant of our privilege to choose to be there. That’s why we try to enjoy every moment and appreciate our expat homes for all that they offer us. I try to ensure that every single day is filled with a little bit of everything: We should feel a variety of emotions and experience new things in order to constantly grow as individuals. We should wonder at small marvels and ponder life’s beauty. We should share a spectrum of emotions and maximize every minute of this life. Appreciating a powerful film as the sun sets over the sea behind us and the full moon rises over the palm trees before us. These moments matter. Part of what I already love about Malta is the passion of life here – there is nothing quiet about Malta. There are kids shouting and laughing in the street, playing hide-and-seek or soccer until a car comes and they have to scatter. There are neighbors talking across balconies, loudly enough for the whole neighborhood to know what’s for dinner. Drivers use their horns liberally – and add hand gestures for emphasis in case you need it. A simple phone conversation on the sidewalk can escalate to what seems like an all-out screaming match, except then you realize the person was merely giving directions in an astoundingly enthusiastic tone. Daily life as an expat in Malta fills the senses. Everything about life here feels big and important and loud. If we can all take that beautiful zest for life and apply it to protecting our planet, World Oceans Day might someday be a celebration of a shift away from detrimental plastics toward a sustainable future. You can watch “A Plastic Ocean” on Netflix or check your local area for screenings. The film is being shown internationally, from Monaco to Taiwan, from Nova Scotia to Virginia. If you don’t see a screening in your area, host one! The more we talk about this problem – especially with the younger generation – the better chance we have of resolving it. A day in the life in Malta…yes, this was just one day, but it clearly had a lasting impact on me. I hope you’ll watch the film and join me in doing what we can to create change. Want to try to keep up with my expat adventures? I send out occasional newsletters – just fill in your info in the subscription box below. I’m also on Facebook, Instagram, Twitter, and Pinterest, so let’s be friends!